Online Photo Crop Editor is a very useful software in the world. Thanks to these kind of softwares, It is very easy to crop the images/photos to the following dimentions. Using the following photo crop software, you are able to crop your profile photo as you like according to given above dimensions. 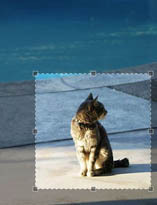 In this software, you need not to give width and height to the photo. It is automatically measured to the above dimensions and crop it to fit with registration for this website. Click on the following link to popup and run the software. For more knowledge, watch the video give below. It is better to watch this video lesson more than once and practise to crop an image as the video teaches.